We have been engaged in pursuing our Master’s in Intercultural Studies with Fuller Seminary in Pasadena, California for the last year. We looked long and hard for a program at the Master’s level that would be useful in our ministry in Southeast Asia; something that would allow us to deepen our understanding of the people that we work among and provide a forum for an exchange of ministry ideas with others who were likewise engaged in other corners of the Lord’s kingdom. The program at Fuller’s has a terrific online platform that contains video and slide lessons of great depth and quality. What it doesn’t have – except on the rare occasions when we can be in Seattle where Fuller’s has a campus – is face to face interaction with other students, and the privilege of asking real time questions of the professor giving the lecture. 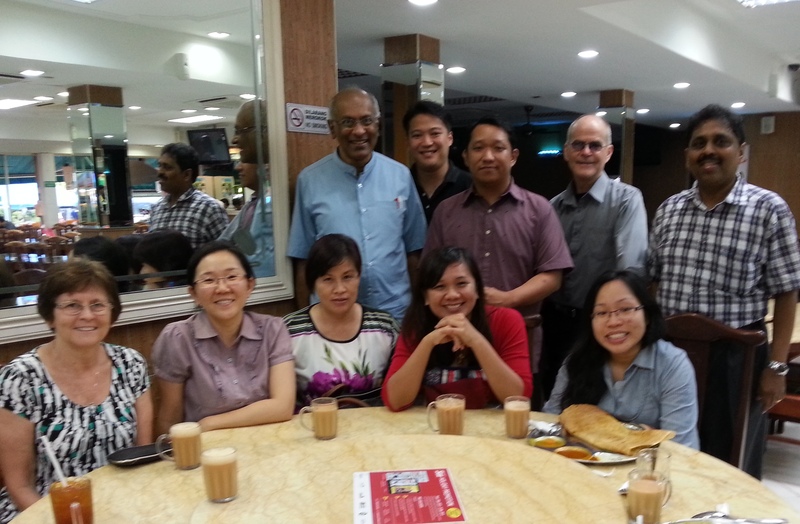 So it was with great joy that we discovered there was a Bible College in Kuala Lumpur whose courses would be accepted for credit with Fuller. This past week we have been engaged in a course called Sharing the Gospel with People of Other Faiths, which was taught by Dr. Ajith Fernando (the tall fellow in the blue shirt, pictured above). It was a great joy as well to interact with Malaysian believers both in the classroom and in the meals that we would share together between classes. Malaysia is not an easy country in which to be a Christian these days, as fundamentalism is on the rise and restrictions on the Christian faith seem to be increasing. Recently the appeals court overturned a ruling by the Supreme Court regarding the use of the name of God, an issue that has led to the banning of Bibles being brought into the country by less intolerant countries such as Indonesia. Yet Christians remain steadfast in their faith and joyful in their fellowship. They are also extremely gracious to those who come from other lands to help them. It was our joy to share with them in learning to be better equipped to serve the God of Glory in this part of the world and we look forward to taking other classes locally in the New Year that will make it possible to reduce our costs and speed up the completion of our Master’s degrees. It also allows us to share our walk in the Lord as we seek to share our faith in love and encourage others to do the same.